A s the oldest line of the Budapest Metro subway system, Line 1 has been in continuous operation since it was first inaugurated on Saturday, May 2, 1896 — with only the underground railway system in London being in operation longer. Photograph ©2014 by Brian Cohen. Although I am not exactly an aficionado of subway systems in general — I do have somewhat of an interest in them — I decided that I wanted to explore this historic subway line and experience it for myself. For a number of consecutive years, I used the subway system in New York to commute from where I lived in Brooklyn to Manhattan in order to get to a special high school which I attended; then to college; and to a place of employment after that — commuting at least an hour each way to each of those places. The need for cost-effective and efficient transportation led to me experiencing rides on subway and rapid transit systems around the world — including but not limited to those which serve Kuala Lumpur, Chicago, London, Seoul, Boston, Paris, Buenos Aires, Tokyo, Madrid, San Francisco, Shanghai, and Washington, D.C.
…unless you score a middle seat at either end of the car, and you are then rewarded with unlimited leg room — as long as the car is not packed — but you must sit in between fellow passengers when the car becomes crowded. This is a rare occurrence in which the middle seat can actually be the most desirable seat. Due to the unusual loading gauge as determined by the shallow tunnel through which it operates, the cars are narrow and are not equipped with many seats. 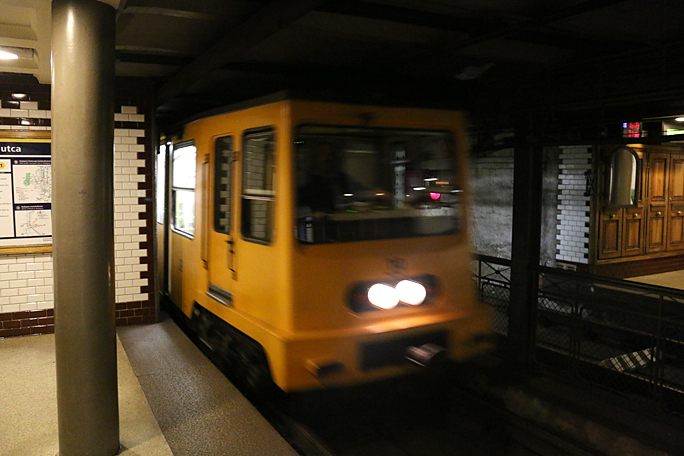 The other three subway lines of the Budapest Metro system are of a different loading gauge than Line 1, which is also known as the Yellow Line, Földalatti, or the Millennium Underground. This subway line reminded me of Line A in the subway system in Buenos Aires, on which I traveled on the old wooden cars. I understand that those historic cars were replaced by modern subway cars in 2013 — 100 years after the first day of public service for that subway line. I have photographs of my ride in one of those wooden cars; and when I find them, I intend to post them in a future article at The Gate. If you have ever heard the term straphanger used for subway riders and wondered why, it is because passengers who are standing grab onto them and use them for support when there are no seats available. Typically, the “straps” currently used in subway cars are no longer actually straps which were used decades ago; but rather constructed of a hard material such as metal. The cars operating on Line 1 in Budapest are an exception. I decide to exit the train at Bajza Utca station to notice and admire the ornate architecture — including the tiled signage indicating the identification of the station. The train on which I was a passenger departed from the station. Similar to the subway stations in New York, glazed white tile decorates much of the walls of the station. These wooden doors seem to be for storage of some type in the Bajza Utca station. Here is another view of the five wooden doors — complete with a mirror. I wonder how old is this wooden ticket booth? I am unsure as to what is this wooden structure and why it is shaped in an unusual manner; but ones like it are found in the other historic subway stations along Line 1. If I find out definitively what it is — as well as its purpose — I intend to edit this article to amend its description. I felt like I was transported back in time at the Bajza Utca station — one of several historic stations along Line 1 — which was clean. There are wooden benches on which to sit while awaiting the next train. Here is a close view of the decoration atop one of the stanchions which help to support the ceiling of the Bajza Utca station. A digital timer keeps track of how long you are expected to wait before the next train arrives at the station — in this case, one minute and thirty seconds. It seems a little strange to see modern technology integrated in a subway station which is historic. The white sign in between the tracks lists all eleven stations on Line 1, with five red chevrons indicating the subway station at which you are currently located — in this case, the Bajza Utca station — as well as the direction in which the trains go. …the next train arrived — along with passengers who were using their portable electronic devices. …and slowed down to stop at it. There are only three cars per train. It was time for me to board the train and depart while the doors were still open. The cost for a single ticket is 350 Hungarian forints, which is approximately $1.25. The subway system in Budapest is inexpensive and rather efficient — definitely a recommended way to get around town. I also rode on Line 3 to and from the international airport which serves Budapest; and I intend to write about my experience in a future article. Additional information — including but not limited to schedules, fares and maps — are found at the official Internet web site of the Budapesti Közlekedési Központ, which is also known as the Centre for Budapest Transport. All photographs ©2014 by Brian Cohen. Dynamic Pricing of Award Tickets: Can it Bite the Airlines as Well as Benefit Them? Very interesting, thanks for sharing that beautiful ride! It was only my pleasure, Dee. Have you been to any baths? Like Gellert?